Maj. Mary Hegar is a helicopter pilot currently serving as an Air Guardsman for the California Air National Guard, and has served three tours over two deployments in Afghanistan. Maj Hegar served in the Air Force for five years as an Aircraft Maintenance officer, and later served in the Air National Guard for six years, where she trained as a Combat Search and Rescue (CSAR) pilot. In her capacity as a CSAR pilot she has flown hundreds of Medevac missions, picking up wounded soldiers and civilians from the battlefield. In order to be qualified to fly over enemy territory in Afghanistan, Maj Hegar successfully completed a grueling training program called Survival, Evasion, Resistance, and Escape, commonly known as “SERE” training. 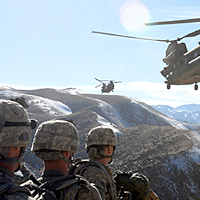 SERE training is widely regarded as one of the most physically and mentally demanding forms of training offered to combat personnel by the Department of Defense. To complete this training, Major Hegar was required to hike up mountainous terrain carrying heavy gear on her person and complete other physically and mentally arduous tasks. In July 2009, her aircraft was shot down by enemy fire over Afghanistan, as she and her crew were rescuing three injured soldiers. Maj Hegar was injured by a bullet that penetrated the helicopter, and once on the ground, she returned fire and successfully completed the rescue mission while under fire. As a result of this incident, she was awarded the Purple Heart and the Distinguished Flying Cross with a Valor Device, two of the highest decorations possible for a pilot. Within a week of being shot down, Maj Hegar and her crew were placed back on flying status to resume medevac missions, until the end of September 2009. She was subsequently upgraded to the position of Aircraft Commander. Despite her leadership and service, there are still combat jobs she is not permitted to compete for. Capt. Zoe Bedell was commissioned as an officer in the Marine Corps in 2007. While serving on active duty, she deployed twice to Afghanistan where she served as the Officer-in-Charge of Female Engagement Teams (FETs). She is currently a captain in the United States Marine Corps Reserves. After being commissioned, Capt. Bedell graduated with honors from The Basic School, which is the first phase of Marine Corps officer training. This means that she ranked in the top 10 percent of her class of approximately 300 Marines for the 26 week course, which includes training on weapons, tactics, leadership, and other skills. Although she succeeded in Marine Corps officer training, as a woman, Captain Bedell did not have the opportunity to compete for assignment to a combat arms military occupational specialty. Instead, she became a Logistics Officer, an occupational specialty in the Marine Corps that is open to women. From June 2010 through April 2011, Captain Bedell trained and deployed 47 Marines to serve as members of Female Engagement Teams. The Marines under Capt. Bedell’s leadership lived with, and went on missions with, all-male combat infantry units. Capt. Bedell’s teams often patrolled more than the men--sometimes twice a day-- and carried the same heavy gear. They lived with the infantrymen for weeks on end in the same sparse conditions in outposts and frequently encountered combat situations. Capt. Bedell left active duty for the Reserves because of the combat exclusion policy. The policy means the Marine Corps could not fully utilize her and there are positions that she couldn't be assigned, despite her many accomplishments, because she is a woman. 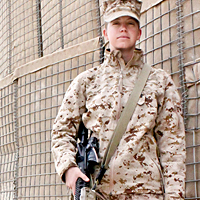 Captain Colleen Farrell is an active duty officer in the United States Marine Corps, and has deployed to Afghanistan, where she served as a section leader of Female Engagement Teams (FETs). During her tour, Capt. Farrell managed between 12 and 20 FET members who would go out on patrols with the infantry, doing outreach and intelligence and assessing security issues. Like the infantrymen they served with, the women in Capt. Farrell’s charge were regularly in danger of drawing enemy fire, being ambushed or hit by IEDs. Three teams of women Marines under Capt. Farrell’s charge were awarded Combat Action Ribbons for receiving and returning fire or being hit by an IED. Despite the fact that she and the women Marines under her charge worked with, and in direct support of, infantry battalions, Capt. Farrell and her FET members could not be recognized as members of the battalion itself, due to the combat exclusion rule. The combat exclusion policy made it difficult for Capt. Farrell and the women in her charge to perform in their assigned positions. Out of concern about violating the DOD’s combat exclusion policy, Marine commanders required all FET members to return to their main forward operating base every 45 days. This artificial and unnecessary maneuver disrupted operations and put both men and women serving in and supporting these units in danger. To accommodate the policy, the women Marines were forced to travel to and from the base on dangerous roads, and they were often taken out of crucial missions, sometimes for a week’s time. If Capt. Farrell were to deploy again, she expects that she would be subject to the same or similar restrictions and interruptions on training and service, stemming from the combat exclusion rule. 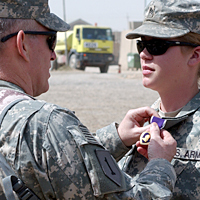 Staff Sergeant Jennifer Hunt is a noncommissioned officer in the United States Army Reserves in the Civil Affairs Military Occupational Specialty. Staff Sgt. Hunt enlisted in the United States Army Reserves in 2001, in the wake of the September 11 attacks on the United States, and subsequently deployed to both Afghanistan and Iraq. In 2004, Staff Sgt. Hunt deployed to Afghanistan in a unit engaged in provincial reconstruction. In addition to her regular duties as a Civil Affairs Specialist, which involved coordinating civil-military operations, Staff Sgt Hunt also accompanied combat arms soldiers on “door-kicking missions,” searching villages for insurgents. She was often the only woman and the only person from her unit going on missions with 20 to 30 infantrymen, whose units are officially closed to women. In August 2007, Staff Sgt Hunt deployed to Iraq with a unit engaged in reconstruction. While serving there her Humvee vehicle was hit by an Improvised Explosive Device (IED), which resulted in shrapnel injuries to her face, arms, and back. Staff Sgt Hunt was awarded a Purple Heart in connection with this attack. Despite Staff Sgt Hunt’s service and exposure to combat situations, her military career options are limited by the official combat exclusion policy. Many combat leadership schools exclude women or limit their participation because of the policy. Because she wasn’t officially part of the combat units, she is at a disadvantage for promotions compared with male soldiers with similar experience, because male soldiers can officially be in a combat arms specialty. SWAN is a nonpartisan, nonprofit organization that supports, defends, and empowers servicewomen and women veterans through advocacy initiatives and community programs. Its mission includes transforming military culture by securing equal opportunity and freedom to serve without discrimination, harassment, or assault. SWAN also seeks to reform veterans’ services to ensure high quality benefits for women veterans and their families. SWAN’s mission and goals are frustrated by the combat exclusion rule, which limits women’s opportunities in the military, endangers women in service, and has an ongoing detrimental effect on many women once they become veterans. The images presented here are from public news sources and republished with consent from those sources. The statements from the plaintiffs regarding this lawsuit are made in the plaintiffs’ personal capacity and in no way reflect the official policy or position of any military service, the Department of Defense, or the U.S. Government.